Congressional township 132, range 43, was organized as Buse town ship, October 3, 1870. The first election was held at the house of E. Grussendorf on October 22, 1870. On July 29, 1874, the unorganized part of congressional township 132, range 44 (now a part of Orwell township) was attached to Buse. The petition for the erection of this township dated September 15, 1870, contains the names of fourteen legal voters and also requested the commissioners to give the name of Buse to the township. Ernest Buse, in whose honor the township was named, was one of the earliest settlers and became one of the most influential men of the county. The names of the petitioners follow: E. Grussendorf, O. Sandberg, Charles Hallberg, A. Hallberg, John Grinager, Samuel Snow, L. P. Holmquist, William Winter, C. G. Lindell, H. H. Randolph, John Dante, C. Lundblad, George W. Gowdz and John W. Woom. The tax duplicate of 1870 car ried the following names Joseph G. Smith, Richard J. Mendenhall, Ernest Buse, Mary D. Wait, Eli W. Dewey, Edwin M. Wright, John Jones, Isaac T.	Comstock, George Beerman, Calvin F. How, Miles C. Davis, Franklin Bardett, Edward Fessenden, Charles Davis, Stephen Dillon, Warren G. Fessenden, George F. Fessenden, and Alfred Barlow. Several of these tax payers were not residents of the township. Buse township has several lakes, but none of a large acreage. The largest are Horseshoe, Pebble, Iverson and Lye. At least a dozen others are scattered over the township ranging in size from a few acres to a hun dred or more. Red river enters the township in section 3, and after meandering to the west, leaves the township in section 5, only to re-enter it in section 6. The river then takes a southerly direction through sections 6, 7, 8, 17, 20 and 29, leaving the township in section 30. If historical records are to be trusted the first actual settlement in the county was in this township along the banks of Red river. The Wrights built the first mill on the river in section 20. They came to the township in the latter part of the fifties and left it at the time of the Indian trouble in 1862. The leaders among the first settlers may be seen in the petition which was presented to the county commissioners in the fall of 1870, when they were seeking the establishment of the township. There has never been a townsite platted within the limits of the town ship with the single exception of Fergus Falls. As the county seat is now laid out, approximately half of it is in this township all of section 3 and about half of sections 2 and 4. The history of Fergus Falls is discussed elsewhere in this volume. The county seat has always been the postoffice for the township. 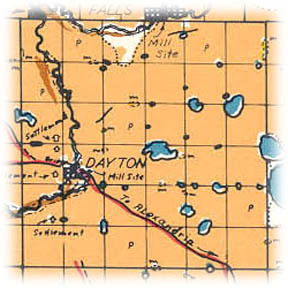 The first railroad projected through the southwestern part of the county was surveyed across this township through what is known as Dayton Hollow. In fact, part of the right of way was actually graded and had it not been for the panic of 1873 it appears that the road would have missed Fergus Falls altogether. Fortunately, when work was resumed on the railroad in the latter part of the seventies it was resurveyed so as to pass through the county seat. The old grade may yet be seen in many places and bears silent witness to the work done on it more than forty years ago. As finally built the railroad goes through the northeastern part of the township, entering in section 13 and passing out in the northeastern corner of section 3. About two miles and a half of Northern Pacific is in the township, running through the northern portions of sections 2, 3, 4 and 5. Some of the highest priced land in the county is to be found in Buse township and its proximity to the county seat makes it one of the most desirable farming sections of the county. There are no rural churches in the township, a fact due to the many churches in Fergus Falls. The present township officers are as follow: Supervisors, C. E. Weigart; clerk, John F. Kottke; treasurer, Claus Albers; assessor, A. B. Palmquist; justice, N. H. Gray; constable, Searcy Wright. Places of birth for Buse Township in the 1905 state census.